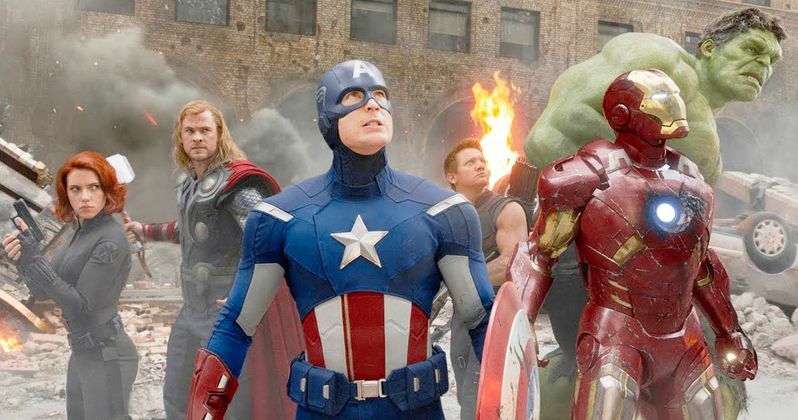 Production on Avengers 4 wrapped back in January, but now some photos have surfaced that offer more evidence that the movie will re-create the iconic Battle of New York from 2012's The Avengers. While these images, taken from the Atlanta set back in January, don't offer any concrete proof that the set is from the Battle of New York, when paired with other evidence, it does seem likely. There will be potential SPOILERS below for Avengers: Infinity War and Avengers 4 below, so read on at your own risk. While the photos surfaced in January, some thought the sets might be used for Avengers: Infinity War, but that set was never featured and it will now likely surface in Avengers 4. The photos, which were taken from a position elevated high above the set, don't showcase any of the heroes, but they feature a few items that were actually seen in the Battle of New York, some military Humvees, a bus stop ad for Southwest Airlines and a late-model sedan. While the Humvees can be explained in a number of different ways, and the Southwest bus stop ad is slightly different, the sedan is the same make and color as the one seen in the Battle of New York, and it has the same amount of damage. You may recall there were other photos that surfaced in early January featuring stars such as Chris Evans, Robert Downey Jr. and Paul Rudd on the set, with Evans seen wearing the same Captain America costume as he was wearing during the Battle of New York in The Avengers. There were also photos from December 2017 that featured Scarlett Johansson wearing the same outfit she was wearing during the opening scene of the 2016 blockbuster Captain America: Civil War, further hinting that time travel will be an important element in Avengers 4. Still, it remains unclear how these time travel elements will fit into the story. The 2016 adventure Doctor Strange helped bring the possibility of time travel into the Marvel Cinematic Universe, with the Eye of Agamotto, a.k.a. The Time Stone. Doctor Strange (Benedict Cumberbatch) used this stone to create a time loop which he used to defeat Kaecilius (Mads Mikkelsen), which was later used in Avengers: Infinity War by the good Doctor to see every possible outcome in their battle with Thanos, and there is only one where they emerge victorious. Strange surprised everyone by handing over the Time Stone, and after Thanos gets the Time Stone and then the Mind Stone from Vision, he activates the Gauntlet and disappears, killing/disintegrating half of the world's population with a snap of his fingers. There have been no plot details released for Avengers 4, but there have been a considerable amount of rumors, with the most prevalent theory being that the remaining Avengers, which include all of the original heroes, coincidentally, will someone be able to find Thanos, defeat him, regain control of the Infinity Stones and use the Time Stone to go back and stop Thanos from wiping out half the Earth's population. Still, that has yet to be confirmed, but until we find out more about Avengers 4, take a look at these set photos, courtesy of Atlanta Magazine, and take a look at the original Battle of New York scene from 2012's The Avengers below.